"I mentioned in an earlier post that John D MacDonald was a prolific producer of sports fiction, that he wrote at least 29 such stories in the early days of his writing career, and that most of these stories were written for now-forgotten pulps with names like Sports Fiction and Super Sports. Those old pulp magazines are some of the rarest and hard to find collectables around, and old issues rarely show up for sale on eBay. It seems like these were the most dispensable of fiction magazines and were not collected with anything near the fanaticism of science fiction or, to a lesser extent, the mystery pulps. I own one story from the sports pulps -- "Blue Water Fury" -- and that's only because MacDonald included it in his first short story collection End of the Tiger and Other Stories under the title ""The Big Blue." The two previous sports tales I've written about came from a "men's" magazine and a Sunday newspaper supplement, and "Elimination Race" will be no exception: It was printed in the most mainstream of mainstream slicks, Collier's." Well guess what? I've since discovered two old sports pulps I own, buried in the back of an old box I hadn't looked in since I moved last June. Each contain a single MacDonald short story, one about golf (yawn) and the other about football. Today I'm writing about the golf story, just to get it out of the way. The problem with sports stories is that if you, the reader, have no interest in the particular sport being written about, your involvement in and understanding of the story can be rather limited. This is especially true of the kinds of tales written for the sports pulps. They revel in the minutia of the competition, lovingly detailing each small nuance, and they assume a reciprocal love and general understanding on the part of the reader. Most of these stories are from the simple "against-all-odds" template and are usually interchangeable with a few small adjustments here and there. My own interest in golf is negligible. My playing days are twenty-five years behind me and as for watching it on television, well... let's just say that there are better ways to waste one's time. MacDonald was an avid golfer after he moved to Florida, but he eventually gave up the game because of its demands on his free time. He felt guilty knowing that the time spent on the golf course could be time spent in front of his typewriter. 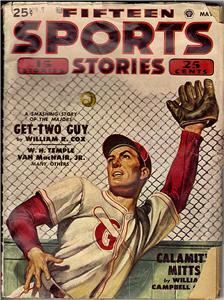 Although "Money Green" fits the profile of the typically detailed sports pulp entry, it manages to engage the non-sports-minded reader's interest because it focuses on character as much as it focuses on the game. 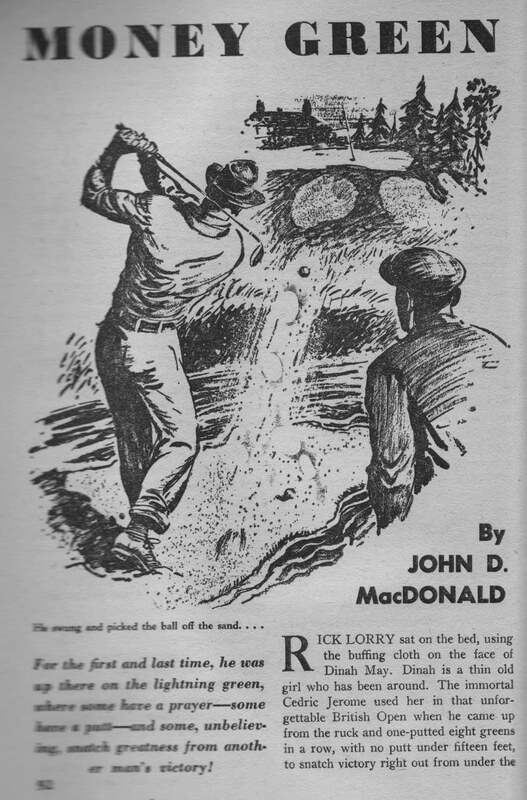 MacDonald tells a typically shopworn story of a past-his-prime golf professional who needs a big win before retiring (he's got a crippled kid, you see) but he does so through the eyes (and first-person narration) of a younger man, and as such the tale moves gently from a story about the narrator to a story about a golf partner. It's an interesting technique that MacDonald had used before and would use again. Still, there's a lot of golf in this story, and if you don't know the game it can get pretty confusing in places. "Before the war I played kid golf. Sharp enough around the greens, but without the beef for the long game. The war gave me the beef and I came back and found I could hit a long, long, wild ball. By '48 I had enough control to start winning small local tournaments, amateur stuff, around Maryland and Virginia. Then, in a tournament at Hillside in Kentucky I shot over my head for a 30 - 30, a sixty, made possible by two eagles, four strokes under the course record. It got a play in the papers but I was still pretty surprised to be invited to try my luck at the Dumott Open." With his wife's blessing he took a leave of absence from work and entered the Dumott. He is nervous and "wound up like a ninety-cent watch," but he is lucky to have an understanding roommate, the older, easy-going Oklahoman Rick Lorry. Rick does his best to try and put things into perspective, telling Tommy that everyone there, newcomers and veterans alike, all feel the pressure. "'Tournament golf,' he said, 'is a very easy thing. You want to get the same feeling sometime, just get a hammer with a nice balance and stand on one foot and see how many times you can club yourself behind the ear before you fall down.'" The Dumott Open takes place in Connecticut and is an annual affair that was put together by the elderly Henry Dumott, "a wealthy perennial dub," years ago with an unusual structure. Its description is mind-numbing and a perfect example of the problems a non-believer has in attempting to appreciate sports fiction. "The low forty qualify. Eighteen holes the first day, twosome, match play. So ten twosomes go into the second day for eighteen holes. The ten survivors then play as twosomes in the morning of the last day, but on straight medal play, with the highest two eliminated for the final and afternoon round. The eight are then split into two foursomes for the afternoon round of medal play, and the lowest scores get a hack at the six prizes." "When he had [money], he spent it. Something about this racket makes it tough to hang onto money. He's got two kids in high school and a young one who has been in more hospitals than you can count. He needs this one, but you'd never tell from looking at him." So who are we rooting for now? The balance of this 5,500-word tale follows the foursome on the last day through the eighteen holes of the tournament. Steve Corning is typically devious, Rick is typically deferential and helpful, Clyde is uncharacteristically playing like the ace he used to be, and Tommy, whose initial run of good luck has run out, is the properly observant narrator. It all comes down to two golfers, Clyde and one of the foursome, and down to the last putt on the eighteenth green. Then a nice, properly vague epilogue between Tommy and Rick. The narrow focus of "Money Green" -- and, I suppose, all of MacDonald's sports stories -- is to be expected. He was writing, after all, for a magazine containing sports fiction and the readership for these titles were obviously people who knew their sports. He fashioned his tales to fit the market, and if he looses a few uncomprehending readers along the way, so be it. It's likely one of the reasons why JDM's sports stories -- and sports pulps in general -- are so rare compared to his other fiction. 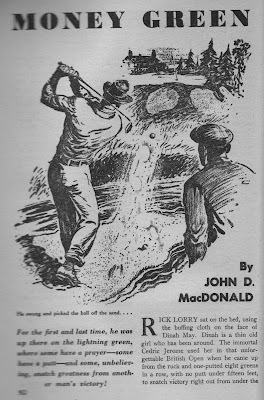 Like all of MacDonald's early short works, I enjoy reading them because of the writing: the structuring, the crisp language, the crafting of character and plot, not because they are about baseball, football, sport fishing, or (even) golf. "Money Green" was published in the May 1950 issue of Fifteen Sports Stories and has never been anthologized.